In my efforts to collect anything "Hickory Valley" I've come across some odd things. I'm reminded that for five miles of track and one locomotive, this was still a legal business, and one that from all appearances, actually did very well until the Great Depression. 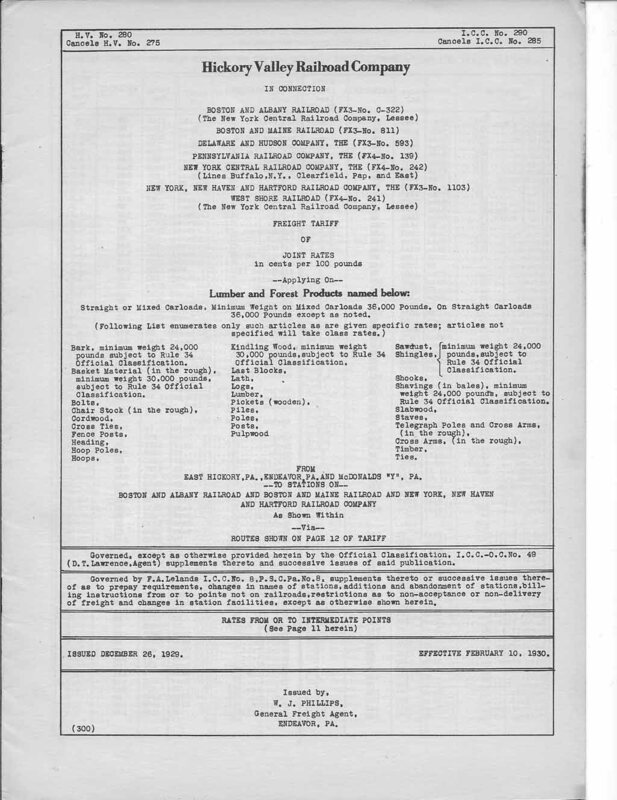 Way before computers, and particularly before deregulation, railroads had to publish rates to freight agents. Public published tariffs existed for everybody, even tiny little operations like the Hickory Valley, and were sensitive to commodity, routed railroad, and destination, and subject to regulation by the Interstate Commerce Commission.. This one was given to me and it stuck me in particular of the date - 1930. Depression or not, this shows the variety of things that were handled on the railroad to all points in New England. Inside the tariff, it's actually pretty simple - 26.5 cents per hundred pounds, on joint rates on virtually everything to New England, to a long list of stations. Curiously, a similar tariff to Ontario in 19.5 to 21 cents, although it would appear further. Such are the mysteries of published tariffs. One odd detail on the tariff that doesn't show anyplace else is a "Y" at McDonalds? McDonalds has remained a mystery on what was any reason to keep the track to the very end of operations when there was nothing ever identified there as a customer.